This scandal is rapidly growing in Portugal, and is now lapping around the ankles of Amaral and his chums. Portimão councillor arrests, what’s it all about? The deputy mayor of Portimão Luís Carito already is famous in Portugal’s legal history as the man who swallowed the evidence, literally. When Carito's house was being searched by police this week he snatched a document from the hands of a surprised officer and ate it, the document, not the hand. That was on Wednesday and a lot has happened since then, the story is unfolding. The charges against the Portimão five are variously "corruption, maladministration, money laundering and economic participation in business" according to the Lisbon Central Court's proseuctors. The crimes in question are related to Portimão's operating company Portimão Urbis and with other companies, including this company's ‘training partner’ that aimed to train employees, but didn’t. This training was for the Picture Portugal project which aimed to create a vast film industry complex, Cidade do Cinema (Cinema City) near the ill-fated Autodrome Internacional do Algarve. This film production project, its finances and those involved are being investigated. 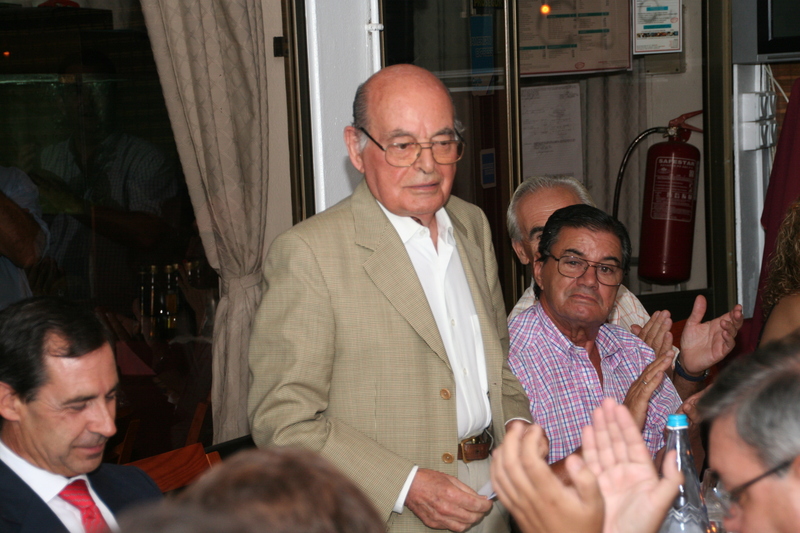 The two Socialist Party officials, Luís Carito and Jorge Campos, were at the time of the alleged offences in 2011 on the board of directors of Portimão Urbis. The others arrested were Lélio Blanca an administrator at Portimão Urbis and two businessmen, Artur Curado from the Algarve Film Commission, and Luis Marreiros a director of Picture Portugal. This Cinema City project had a budget of €3 billion and never left the drawing board. Portimão council invested €700,000 in 'research and consulting,' despite being the most indebted council in the country and almost totally lacking in commercial expertise. Travel to Los Angeles to meet with stakeholders and meetings in India involving minister Paulo Portas to win investment... the picture is emerging and there is of course more to come. What seemed at first to be a case of a shell company invoicing for services not rendered could turn into a major fraud. Picture Algarve modestly promised to transform Portugal into the ‘cradle’ of world cinema and Portimão council and the Algarve Film Commission submitted the project in May 2009 which provided for the creation of a film making complex and more bizarrely the construction of a theme park. Now we move to the Autodrome where the film industry complex was planned using a 150 hectare plot next to the Autódromo Internacional do Algarve. The project management claimed to have recruited the actor Joaquim de Almeida as one of the media faces to promote the project. Back then Luís Carito, the president of Portimão Turis, later integrated into Portimão Urbis, revealed that of the initial investment of €750 million, €550 million was to build the amusement park, and the remaining €200 million was for the production of the film industry complex. The amusement park business was linked by Carito with the American company Universal Studios, and was to be on the theme of ‘cars and the history of cinema.’ It is not yet known if Universal Studios bosses have ever heard of Carito, Portimão or the Algarve, but we have asked. The proposed film industry complex was to include the construction of eleven film studios, two of which were to be completed by late 2010, which would lure film producers and directors to the Algarve. In 2010 the project led by Picture Portugal’s Artur Curado and Luis Marreiros, was to be managed in partnership with Portimão Urbis which would hold a 20% stake in the company. In March 2010, Luís Carito, then president of Portimão Urbis, admitted that planning had slipped due to delay in completion of the economic study, but assured the world that the project would continue. Apparently investors were lining up to back this film complex at the southwestern tip of Europe. CBS-Paramount, Universal, Fox, Sony and Warner Brothers were allegedly all set to join Portuguese investors. US based ambassadors of the enterprise were the actor Joaquim de Almeida, and Carlos Mattos a Portuguese businessman and winner of two US Academy Awards. Their task was to convince the US big hitters to invest a substantial part of the €25 million needed to build the first phase of the studio complex. There was even talk in 2009 of re-filming the Steve McQueen classic "Le Mans" with Brad Pitt, Al Pacino and Penelope Cruz. This however required USD52 million from Picture Portugal by the end of 2009. An anonymous tip-off in 2011 led police to start a detailed investigation into the management and cash trail involved in this whole ill-fated enterprise, culminating in this week’s arrests or many of the key players. This user is not currently sharing any details about him or herself. Oh, I think a good few of them are going to be running for cover, Sabot. I do hope none of the 'Algarve Film Commission' mega-bucks has been diverted to anti-McCann propaganda? You've got to love Karma, really. Every single one of the things the Amaral supporters accuse the McCanns of doing, turns out to actually be being perpetrated by their own kind. ETA, where's Morais got to? She's been AWOL for months now. You wouldn't have believed it if someone had said this would happen, would you. But it does rather prove the Transference Theory. All rather worrying when you consider what they have accused The McCanns of. Especially when you consider the number of apparent Paodophiles commenting. Now that is shocking. I wouldn't trust that woman or her "Husband" any further than I could throw them. But I bloody well knew it. I just couldn't remember precisely what I had seen. So why did she get the job, and what was her husband doing in the background? Looks like it's all going to come out in the wash, Sabot - Amaral and his chums may well have much more to worry about than libel trials. And then there's Cristovao's 'dossiers' - they should be making interesting reading. Heaven knows what is going to come out when he's in the dock. When Carito's house was being searched by police this week he snatched a document from the hands of a surprised officer and ate it, the document, not the hand. It's beginning to look that way, Bonny. I can't see this sort of hanky panky going on in Portimao without Amaral knowing about it. I mean, he's the worlds finest, isn't he? He's never done boasting about hob-nobbing with local officials, Sabot - he was in the Carvi Brassieri with one of them the night Madeleine was abducted. The Mayor of Portimao and assorted staff were at his birthday bash. Tick tock and all that. The problem with people of his ilk, Bonny, is that they are so puffed up by their own importance that they think us plebs are thick. This is why they ultimately give themselves away. It will be interesting to see if the net spreads to Lagos, to their mayor Julio Barroso. He's a really good chum of Amaral's - he's the one who supplied the gym hall for Eddie to play with 'evidence' in. You have to chuckle at their stupidity. They don't seem to be good at doing their homework. It's all catching up on them now........ Shame. It's the potential scare of it that's awesome, Lily. Never mind, they got some nice jaunts to LA and India. And I bet it was first class all the way, on proper airlines - no Ryanair for the head honchos of Portimao. I wonder if any of them felt deflated when they were told that no one had heard of them? They would not have met any big hitters either. The potential scale faced no potential for doing business with them as they were out in cuckoo land. The savvy bean counters would figure it out faster than you can say Portimao. They really do fancy themselves though. Wonder if there will be a few familiar names in there? The Mayor of Portimão has written an open-letter to his electors quashing “the rumours that have been circulating recently in a bid to slur his good name and dignity”. According to a copy of the letter made available to this newspaper, Manuel da Luz says he was advised by a number of citizens that “rumour had it” that he was wearing an “electronic tag” and under house arrest for being “caught at the airport, on the run with a suitcase full of money”. The Mayor explained that “nothing could be further from the truth”, and that he had filed a complaint over the rumours with the courts. “If there are people who don’t like the President of the Borough Council, that doesn’t worry me at all. It’s their problem”, he wrote, adding that the rumours were “dirty tactics”. What, is it far from the truth because he didn't have a tag - yet - and the suitcase of money is still under the bed? That's a good bit. No-one who has heard the Golden Bullets tape (confirmed as genuine by Joana Morais) has any doubts about what kind of a person Amaral really is. His cult are in for a very rude awakening. And it appears that Sofia Leal is in it up to her pretty little surgically lifted neck. No wonder she decided to divorce him. Not that this will help her. They are all steaming in corruption down on The Algarve, including The PJ. I can't even begin to disentangle what it's about, beyond euromillions going AWOL in the Algarve. And yes, it is very relevant indeed to the McCann case. With that much money floating around, what wouldn't those involved want to cover up? Someone ought to be questioning Sofia Leal. But I expect she would say that her husband threatened her. And who wouldn't believe that. Can we say things like, Al Capote was eventually caught for tax evasion? Or their other favourite cliche, Follow the money? Maybe we should speculate that the real reason the CPS was in Portugal is that some Portuguese citizens associated with the McCann case had been using British banks to launder the missing euromillions and billions? Whoever would have thought that people associated with Team Gonc would be in the Portuguese media with words like fraud, off-shore bank, money-laundering, etc, next to their names? 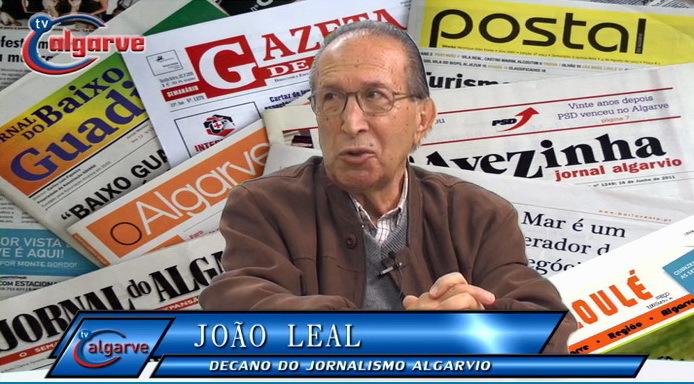 It should always be remembered that Sofia Leal's father enjoys the honorific "decano" or doyen of Algarve journalists. The next day November 18 is held in the Vilamoura Casino, dinner in honor of John Leal. Entitled "50 years of career journalist," the event aims to reverse the profits in favor of the Institute D. Francisco Gomes, aka House of Boys in Faro. Hélder Martins, President of the Algarve Tourism Region, Joel Pais - Administrator Solverde / Casinos do Algarve and Jose Apolinario Mayor of Faro are some of the names that are part of the commission of honor. 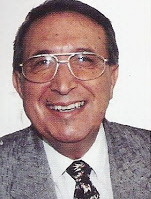 John Leal for over 50 years, helped develop the prestige and image of quality and appreciation of the Algarve tourism and society. Honor a man who, "through the meritorious work and great dynamism, contributed greatly to honor and develop the image of quality and appreciation of" his "Algarve tourism and society," is the aim of a group that is preparing a Dinner in honor of John Leal, a journalist with more than 50 year career. This Algarve "has always been a staunch defender of the values ​​uncompromising Algarve, following the step by step development of the entire region, as such, deserves the recognition of all who know him," said the organizing committee. The dinner is scheduled homage to Casino Vilamoura, on the 18th of November at 20:00, the inscriptions may (at 25 euros, reversing the recipe for the Instituto Dom Francisco Gomes, aka "House of Boys" ) be made the following contacts: Eurotel Altura, telephone 281956450 and email hotelaltura@mail.telepac.pt; Algarve Tours, phone 289890200 and email comercial@algarve-tours.pt, and Hotel Algarve, phone and e-282402000 hotelalgarve@solverde.pt mail. 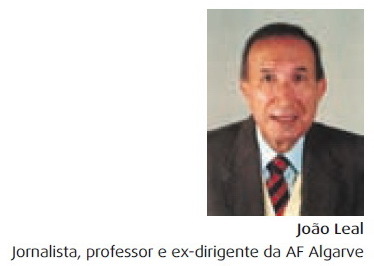 Our associate "chop" and journalist John Leal, among others, was honored by the city of Portimão. 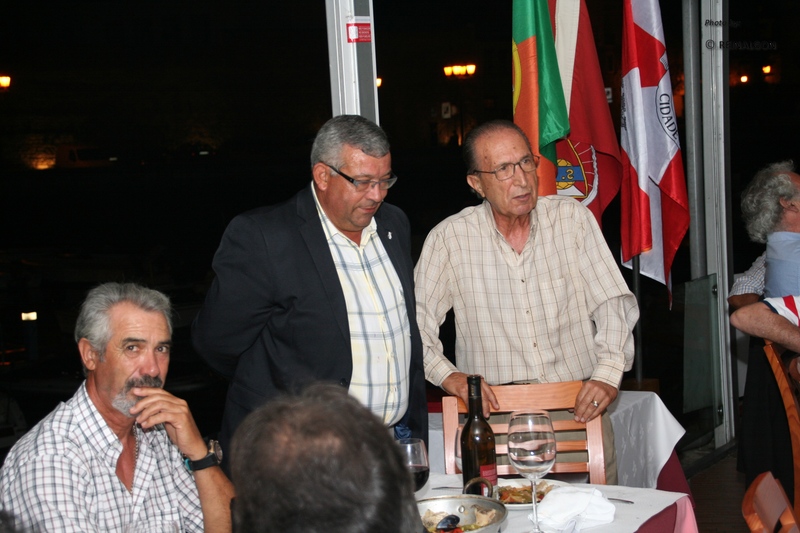 At a ceremony held during a dinner at the Golf Club Reguengo Morgado in Portimão, the President of the Municipality Manuel da Luz, gave its award to John Leal, who thanked impromptu, being much applauded. Chop or "costeleta" seems to be the nickname given to former pupils of the Escola Tomas Cabreiro in Faro where Joao Leal was apparently educated. He has worked at this paper for a long time. Yes, involved as a director of the Football team as well. And Joao Leal was here with Rui Gomes da Silva at an Algarve Benfica Supporters event back in 2012. 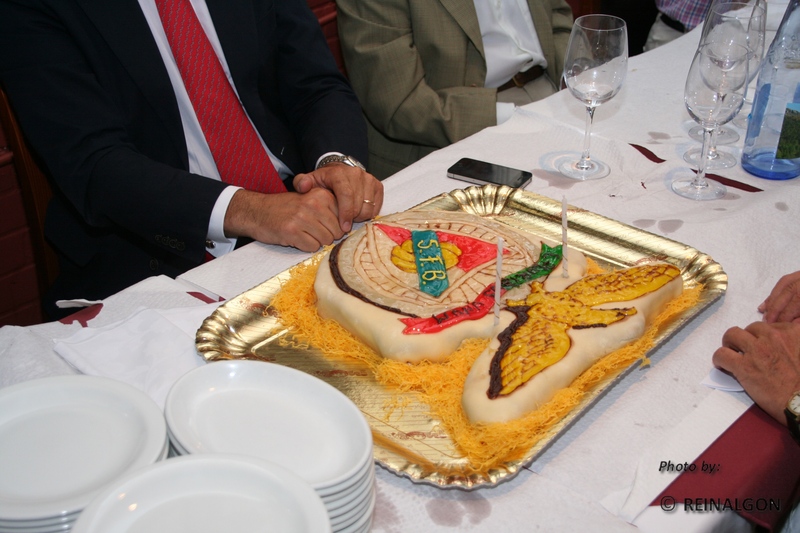 Da Silva, the vice President of Benfica is the man in front of the cake in the first picture, and the man on the far left in the second picture while Joao Leal is stood in front of the flags in the third picture.